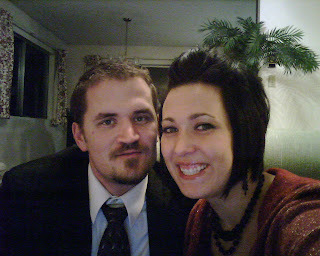 MY HUBBY AND I HAVE BEEN MARRIED SEVEN PLUS YEARS, AND I DONT THINK WE HAVE EVER HAD OUR PICTURE TAKEN TOGETHER, JUST THE TWO OF US. 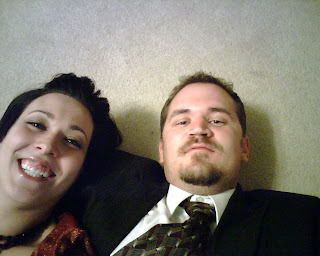 SO, I TOOK IT UPON MYSELF TO TRY AND GET A GOOD PHOTO OF US, AND SO I HOPE YALL LAUGH AT OUR PHOTO SHOOT, CAUSE IT TOOK US QUITE A FEW TAKES TO GET ANYTHING DECENT, I GUESS WE COULD HAVE SAVED A LOT OF TIME IF WE WOULD HAVE HIRED SOMEONE TO DO IT, BUT THEN YALL WOULDN'T BE ABLE TO ENJOY OUR LITTLE PHOTO SHOOT. I LOVE MY HUBBY. IN THE LAST SEVEN YEARS WE HAVE GONE THROUGH A LOT, AT TIMES WE'VE HAD TO FIGHT TO KEEP IT ALL TOGETHER, BUT WE ALWAYS COME OUT TOGETHER. ONE DAY WE'LL BE OLD AND ROCKIN IN OUR POURCH CHAIRS TALKING ABOUT ALL THE STUFF WE DID, AND NOT SOME MUCH THE STUFF WE DIDN'T. LIFE IS TOO SHORT TO NOT ENJOY IT, EVEN IF IT'S IN BITS AND PIECES, AND IF WE DIDN'T STRUGGLE, WHAT WOULD WE BE GREATFUL FOR? EVERYONE HAS THEIR OWN LOT IN LIFE, THEIR OWN DREAMS, PLANS AND HOPES, BUT HOPEFULLY WE ALL FIND JOY IN THE SIMPLICITY OF LIFE, THE STRENGTH OF EACHOTHER, AND THE KNOWLEDGE THAT WE ARE LOVED. IF THERE IS SOMETHING IN LIFE I HOPE TO ACCOMPLISH, IT'S IN THE SIMPLICITY OF JUST BEING. BEING WHO YOU ARE, LOVING THOSE THAT NEED EXTRA LOVE, TEACHING THOSE WHO SEEK FOR A GREATER KNOWLEDGE, AND MAKING A HOUSE A HOME, NO MATTER WHO COMES TO STAY, SHORT OR LONG. I LOVE MY HUBBY AND THE WORK HE PUTS INTO KEEPING OUR BOAT AFLOAT. I KNOW WITH HIM ON BOARD WE CAN SAIL FOR A LONG TIME, AND WHEN OUR TIME HAS COME, WE'LL SET SAIL ON A WHOLE NEW ADVENTURE, TOGETHER. LOVE YOU BABE! This is such a GREAT thought! Thanx for being so positive and bubbly. I'm glad I moved here, and I can meet people like you!